Getting your kids to give back can be fun and easy, especially when they know they're providing toys and entertainment for adorable dogs and cats in the local animal shelter. While awaiting adoption, it's important for shelter animals to stay active - both physically and mentally - and get as much environmental enrichment as possible. That's where pet toys come in handy. Throughout the year, animal shelters are in need of donations in order to provide all of the items that their animals need to stay happy and healthy while under their care. You and your kids can make a difference by crafting some toys to drop off at the shelter as gifts for the animals. 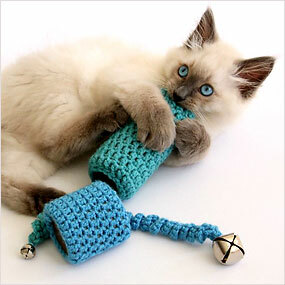 We've pulled together a Pinterest Board with our most favorite DIY toys for dogs and cats. Click Here for additional ideas to jump-start your inspiration. Most cats LOVE catnip! The scent of catnip can make cats go crazy (in a good way or bad). Cats can spend hours batting around their catnip filled toys. 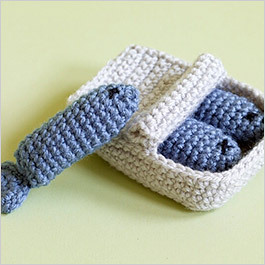 They are small enough to keep in shelter cages and a fun way to keep cats entertained. Chew toys provide hours of entertainment for dogs. They love to make noise, manipulate the object and tear it apart. Dogs also love it when we get involved and play. Tug toys are great for dogs to chew on, but are even more exciting when shelter volunteers take the other side and pull! 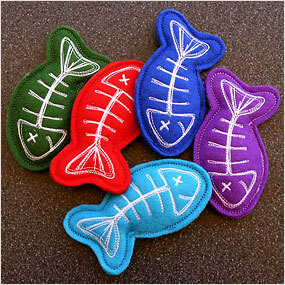 They are great for physical activity and can help to stop destructive chewing on inappropriate objects. Many cats are surrendered to the shelter for scratching at their owner's furniture. Scratching is a natural behavior for cats and almost acts as a manicure to keep claws healthy and clean. Give shelter cats a prop to let their claws out on and provide them with a place to direct their other natural habits, like swatting and hunting. Remember to size your toys to fit inside a shelter cage or cat room. 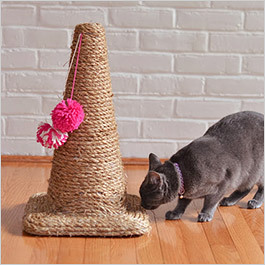 If you're not a crafter but still want to give the shelter animals something to play with, there are lots of ways to provide entertainment with some simple items from around the house. 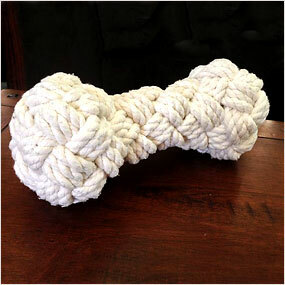 Placing some dog treats in old towels, wrapped up tight to cover the treats, makes for a hard but fun work out. 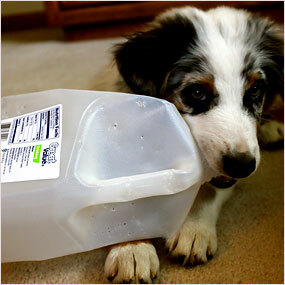 Small holes can be poked in the bottom of plastic bottles and filled with kibble to make a cheap and easy food dispensing chew toy. PVC pipes can be fitted with removable end caps so that any scented product can fit inside and allow a dog to play. Empty plastic peanut butter jars, milk cartons, cardboard boxes, paper towel rolls, soda bottles and bed linen can all be used in some creative and simple way. All images were found on Pinterest. Visit our Pinterest Board "For Our Furry Friends" for reference to the original photograph. 1. Contact your local shelter and see if there is anything they need in particular. Find out how many dogs and cats they are sheltering at the moment and if any have specific needs or wants. 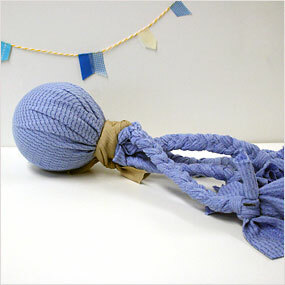 Also, it's useful to make sure they accept homemade toys before you begin crafting. 2. 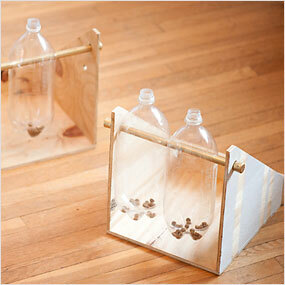 Use as many recycled materials as you possibly can. Collect materials from around your home or ask family and friends to keep a look out for anything they have that might be useful. 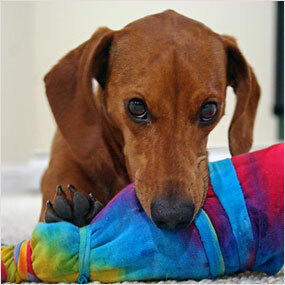 Keep in mind that your materials should be thick and durable and able to be turned into a dog or cat toy simply. 3. Be sure to think about your materials carefully. Remember to avoid making anything that is too small and could cause the shelter animal to choke. 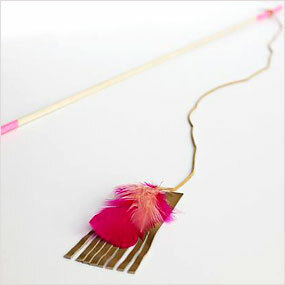 If you are using nails, be sure to assemble your toy well and don't leave anything sharp sticking out that could be dangerous. 4. 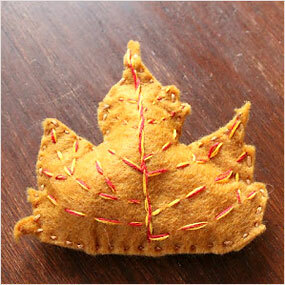 Think about hosting a "shelter toy crafting day" for your friends and family. Ask people to bring materials and set up a work area where you can collectively craft as many toys as possible to donate to more animals. The more you make, the more happy animals there will be. 1. Pack your toys and get them ready to drop off at the shelter. 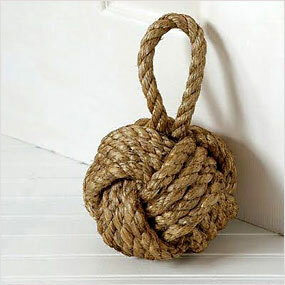 Combine all of your items in a basket or tote bag. Remember, these baskets and bags can also be re-used by the shelter! 2. Think about where you will donate your toys. Talk about the different products that you are donating and what they will be used for. Who needs them most? Discuss the idea of the donations allowing animals to live a warmer and more comfortable life. Make it a meaningful task. 3. Write a card to accompany the donation. Allow your kids to understand exactly what they are donating and why they are doing it. Write a card that explains what you hope your donation will do for those animals receiving it and include a message to the animals.